Our 2nd event in this series – Women & Men as Allies: At Work and At Home – was a conversation about how women and men can be allies in the efforts to balance work and family. 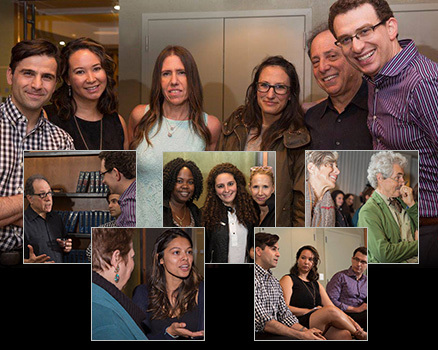 The event – in partnership with The Center for for the Study of Men & Masculinities – featured a panel discussion with Jessica Bennett, Simon Isaacs, Alicia Jay and Josh Levs moderated by Marianne Schnall and Michael Kimmel – and was supported by the Woodcock Foundation. Like our initial event and previous FemSalons on the State of Feminism, Women & Money: Re-imagining Economics, Women & Peace, and Our Inner Lives, the room was filled with incredible people, including members of the Feminist.com board and advisory board, along with many longtime friends, supporters and colleagues. Learn more about Feminist.com and our programs! Stay tuned for more upcoming events to be announced. Stay tuned for more information about our plans for future events and comprehensive Women & Men as Allies microsite and how you can support our work. More photos can be found in the album on Feminist.com's Facebook page. Click here to see our program. Once again, thank you to our generous sponsors and amazing partners! The Center for the Study of Men and Masculinities The Center for the Study of Men and Masculinities was founded in 2013 at Stony Brook University – the first such center on the world dedicated to exploring men's lives and engaging men and boys for gender equality. Our mission is to foster a dialogue between researchers and activists working to engage men, and to inspire researchers to provide activists with work they need to be more effective. The Center runs seminars and develops activist-based research projects. The Woodcock Foundation is a progressive family foundation established to link family creativity and resources with community development needs. Trustees select areas of interest, identify individuals within those areas who possess strong leadership skills, and then invest in them with both financial as well as technical resources. Since 1996, Woodcock has awarded over $30 million (at present around $2.5 million per year) to over 50 organizations, primarily in the areas of social enterprise and economic development, food systems, large landscape conservation, education, media & democracy, gender equality, and civil society. And as always – thanks to all who joined us at the event! It was an inspiring evening and we were so happy to share it with our friends, colleagues and supporters. Join our mailing list to receive updates about our planned Fall 2016 event and comprehensive Women & Men as Allies microsite – and how you can support our work.